A new installment of “Sharing the Stage,” a series that pairs performances by acclaimed music stars with those of Island youth, will take place at 8 p.m. Friday at the Red Bike. 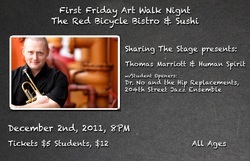 This time, the series brings trumpeter Thomas Marriott and his band, The Human Spirit, to town. Marriott, who lives in Seattle, is widely regarded as one of the most exciting jazz musicians to emerge on the national scene in more than a decade. His initial success, resulting from his work with Maynard Ferguson in New York City, has led to his collaboration with a long list of artists and over 100 recordings with musicians of all genres. Teen performers will include two student bands, Dr. No and the Hip Replacements and the 204th Street Jazz Ensemble. Dr. No and the Hip Replacements features Noah Baseleon-Abbott on sax, Ari Edgecombe on bass and Tanner Montague on drums. The 204th Street Jazz Ensemble consists of Peyton Levin, Cieran Murphy and Corry Fox. These bands will also sit in with Marriott for a performance of Wayne Shorter’s Footprints, originally composed for Miles Davis. Tickets are $5 for students and youth with ID and $12 for adults. The first two shows in the “Sharing the Stage” series featured the band Visqueen and rappers Macklemore and Ryan Lewis.